The Bodleian Library, Oxford (above right) – Good: You’ve died and gone to Heaven. 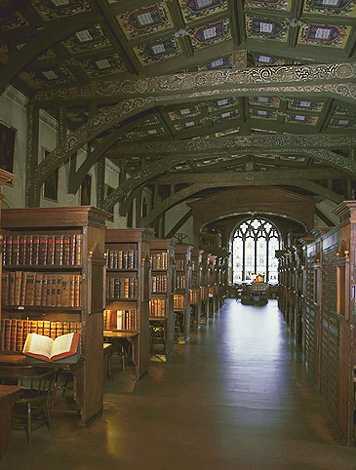 That’s certainly what working in the medieval Duke Humfrey’s Library feels like; a simply astonishing workplace, and it’s just a privilege to walk in there (where the tourists cannot go! 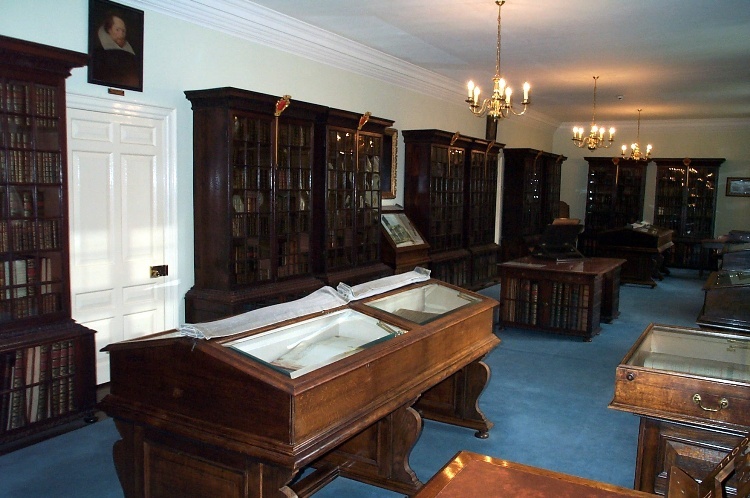 ), let alone to sit at desks amid the rows of ancient volumes. If you want to get a sense of what it would have been like to be a monk working on an illuminated manuscript in the Middle Ages, there’s no better place. Bad: If you want to get a sense of what it would have been like to be a monk working on an illuminated manuscript in the Middle Ages, there’s no better place – i.e. the hard seats, the lack of space, the lack of light in winter, the deathly glares from one’s fellow monks/readers when one breaks the vow of silence (Middle Ages: inadvertent audible meditation upon the Lamentations of Jeremiah; today: squeaky shoes). Cambridge University Library – Good: There’s just so much on open shelves! OK, the place is vast and rambling – one keeps expecting to come across confused bearded creatures who’ve been roaming the corridors for years, a la the Flying Dutchman, trying to find a particular book or the exit – but CUL treats its readers like grown-ups by actually putting the books where people can read them. Bad: I’ve tried to eliminate my innate Oxford bias here, but it has to be said: sorry, Cambridge, your library really does look like a very, very big crematorium. The Imperial War Museum (first visit only last week, so I’m very much a newbie there) – Good: A state-of-the-art online catalogue, plus documents delivered to one’s desk, rather than having to queue up behind ten people whose requests have gone missing and/or who have fiendishly obscure queries that the issuing staff can’t answer; this is the way academic study should be. Bad: the air con has clearly been designed to give those studying winter campaigns in Russia a stronger sense of empathy. 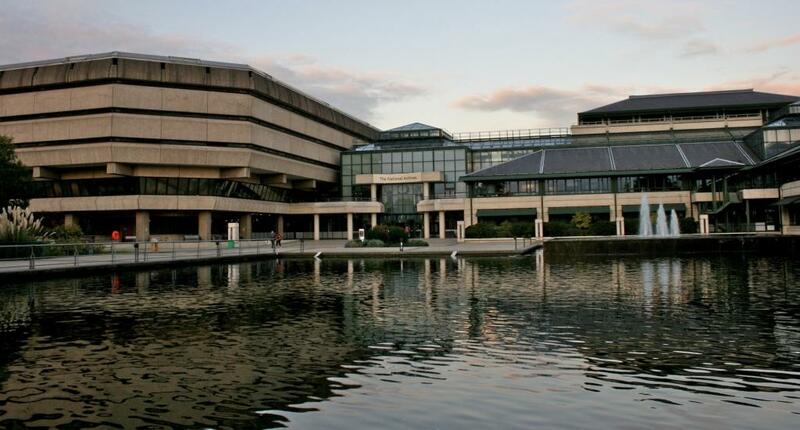 The National Archives, Kew (above) – Good: Spacious, modern, well laid-out, rapid document delivery times, plus of course an absolute treasure trove of amazing original documents. I’ve spent many a happy hour ploughing through boxes of filthy seventeenth-century manuscripts, often in the knowledge that probably nobody has looked at the same material for a century or maybe longer. Bad: It looks like a Dr Who location, and it’s in Kew. Now, Kew is a very nice place – gardens, palace, river, etc. But to get to it means either a journey literally to the outer limits of the most obscure branch of the District Line (why are there always far more Ealing Broadway trains than ones to Richmond?) or negotiating the North Circular Road, a prospect far more daunting than any of Dante’s circles of Hell. And why is it that wherever I sit, even in the ‘quiet area’, I always seem to be sitting too close to the grannies who want to chat about their latest discoveries in the family history of their Great Uncle Herbert? The National Library of Wales, Aberystwyth – Good: OK, cards on the table, this is my favourite repository anywhere, and not just because it’s Welsh. Airy, loads of space, pretty efficient document delivery, and best of all, a stunning view across the town and castle ruins to the sea. Sitting there at dusk in autumn or winter is an experience to die for. Bad: It’s in Aberystwyth. The National Maritime Museum, Greenwich – Good: Location, location, location again. World Heritage buildings in a stunning setting, plus a vast collection of material of all sorts, plus state-of-the-art digital catalogues and other study aids. Bad: Tourists. School parties. Endless film crews. But above all…the reprographics charges. To be fair, I could have made pretty much the same criticism of the Bodleian, the British Library, and several others on this list, but having dented my bank balance quite significantly when funding the illustrations for Pepys’s Navy, I have a particular gripe about the NMM. Maybe one day the Office of Fair Trading will investigate repositories’ reprographics charges, and their claims to hold the copyright for works of art and manuscripts when they actually don’t…but I won’t hold my breath. The Pepys Library, Magdalene College, Cambridge (left) – Good: Working on Pepys’s original manuscripts, surrounded by his entire library, in the bookcases built to his specification, all still shelved in exactly the order he originally established, in the building specifically built to house them all: let’s face it, it just doesn’t get much better than that. If you don’t feel inspired by the spirit of Pepys and the seventeenth century as a whole when you’re in there, you’re probably dead. Bad: The only repository where the term ‘opening hours’ is literally correct in the strict grammatical sense. When I was working there a lot, it opened to the public from 11 to 12, then from 2 to 3, but researchers could be literally locked in between 12 and 2. Then some health and safety jobsworth came along and decreed that the risk of researchers being burned alive if a fire broke out at lunchtime was clearly too great, so it then became a case of get in at 11, work frantically for an hour (with Japanese tourists and the like looking over one’s shoulder), kill time for a couple of hours, then repeat the experience in the afternoon. But in a way it all added to the glorious uniqueness of the experience! I loved reading this. Well-written, informative, highly entertaining. Thank you! Lovely! I’ve only had the pleasure of actually getting to study in one of these places – the British Library – but hope for more opportunities in the future! Wow, lovely! I’ve only had the pleasure of actually doing research in one of these places – the British Library – but would love the opportunity to spend time in all of them. On my NEXT trip to the homeland, I’ll have to plan a month, at least! This is unbelievably handy and awesome. I’ve … gone ahead and reposted this several places on facebook, twitter especially in graduate student facebook groups. Hopefully people will give this a read. Great tips. Can’t wait to read the next installment.